Whether you are a school, hotel, pub, club, restaurant or possibly a bed and breakfast, you will most likely own and use a commercial fan to power your extraction system to remove the steam and heat from your commercial kitchen. These fans are extremely powerful pieces of machinery operated by a very powerful motor to enable the speed required to remove the air from your kitchen. This is one of the most important parts to your extraction system which if left in a poor condition can deteriorate losing it productivity in its ability to remove the air from your kitchen, increasing the temperature in your kitchen and moisture which will cause mould to build up. 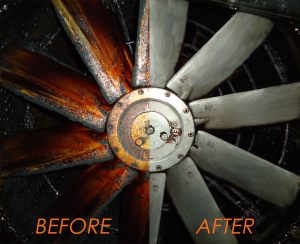 Here are OvenKing we provide commercial fan cleaning in Bournemouth, Poole and Christchurch to all business in these areas, if you feel that your fan is beginning to slow down due to a build up a grease then give us a call on 01202 70 50 45 we will surely be happy to help you and answer any question your may have, or, if required, come out and see you for a no obligation quote.